On May 14th Tony Barrow, the press officer to The Beatles up to the formation of Apple, sadly passed away. Tony played an important part in The Beatles story, writing many of the sleeve notes on albums and EP’s as well as accompanying them on tour and attending the many press conferences they did. Tony was born in Crosby, a Liverpool suburb, in 1936. His interests as a teenager were Rock N Roll and writing. These interests led him to writing for the Liverpool Echo as a journalist about the latest music releases. He was known as Disker in this column. Interestingly he then worked for Decca as a sleeve note writer. 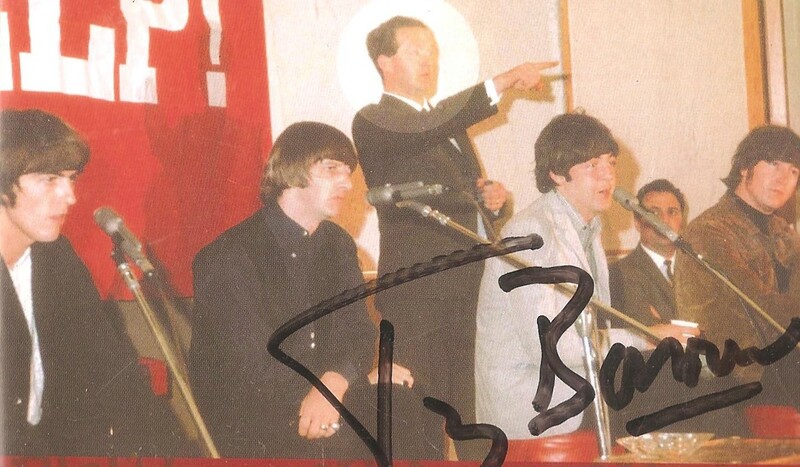 Brian Epstein then wrote to Disker asking if he could write a column about The Beatles. However, the column was about record releases, and at this time in 1961 The Beatles had no record contract. Brian then met Tony at Decca, which eventually led to the infamous Decca audition on January 1st 1962. Following their successful audition at EMI, Brian asked Tony what else he could do to promote this first single “Love Me Do”. Tony agreed to write a press release whilst still working for Decca. Eventually Tony wrote the sleeve notes for the first album “Please Please Me”, and then for the second album “With the Beatles”, where he called the Beatles “The Fabulous Foursome”, later abbreviated to the Fab Four. So Tony can be credited with the phrase “The Fab Four”. Brian offered Tony a full time job at NEMS after the release of the first album, saying he will double whatever Decca were paying him. Tony accepted, and the rest is history, as they say. Perhaps Tony’s best sleeve notes are on the reverse of The Beatles Hits EP. Starting the notes with “The four numbers on this EP are from the Lennon/McCartney songbook. If that title sounds a trifle pompous, may I suggest you preserve this sleeve for ten years and exhume it from your collection around the middle of 1973 and write me a very nasty letter if the pop people of the ‘70’s aren’t writing with respect of at least two of these titles as early examples of modern beat standards from the Lennon/McCartney songbook.” How right he was. Tony was by now one of the famous “inner circle” of The Beatles family He was there when they met Elvis Presley at Bel Air, in August 1965, he saw first-hand the reaction in the USA to the John Lennon quote “We are more popular than Jesus”, and he was at Manilla airport when The Beatles were punched and kicked, and eventually led them to quit touring. After The Beatles split he set up his own PR company, Tony Barrow International, working with groups such as The Kinks and The Bay City Rollers. He later returned to journalism and appeared on many TV documentaries and in 2005 wrote his biography “John, Paul, George, Ringo and Me”. Tony, we at the BBFC are sad to hear of your passing and thank you for the part you played in giving the world The Beatles.